In the olden days of the wild, wild west, catching a horse thief was a serious matter. After someone had stolen a horse and galloped away into the sunset, it wouldn’t have been easy to trace him again. 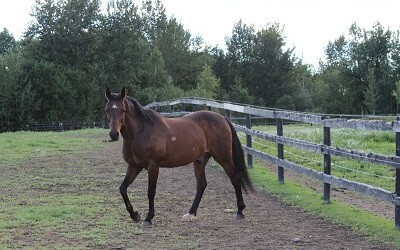 One Alberta ranch has decided to deter would-be horse thievery by setting up wireless cameras. Western frontier quips aside, the Rusty Horseshoe Ranch, based in Parkland, Alta., has been named the third and last finalist in D-Link’s Extreme SMB Networking Makeover contest. The competition features $10,000-worth of networking gear from D-Link Systems Inc. to help a small business spruce up its Internet connectivity. Located about an hour outside of Edmonton, the ranch serves as a place to board horses, and it also provides riding lessons and tack repairs. It’s the perfect spot for equestrians and horse enthusiasts, with about 75 acres of trees interspersed with rolling, hilly terrain to ride over. But with that much space, it’s difficult to keep an eye on the property, says Chris Pettican, the ranch’s owner. A systems analyst by day, Pettican and his wife, Keitrina, have lived in the city since they were young. They finally moved back into the country to run their ranch, and right now, the couple and one of their daughters are its main caretakers. As they don’t have too many hands to run the place, he entered the D-Link networking makeover contest so he could set up wireless Internet Protocol cameras to keep watch over some of the main areas of the ranch. “We can’t cover it all with cameras, but one of the things we’d like to be able to do is to have a recording of who comes on and off the property, so that if horses go missing, for example, we’d be able to know who it was, so that people feel safe,” he says, adding it’s also an extra safety precaution in case a rider gets hurt while he or she is out with a horse in the arena. In the four years since they opened the ranch, they’ve never had any incidents of horse theft. But right now, the Rusty Horseshoe Ranch only has consumer-grade cameras in a few of the barns. The cameras aren’t always reliable – sometimes, they’ll inexplicably cut out, and someone will have to troop out to the barn to reboot them. Pettican says he feels that’s because the Internet connection is unreliable. That’s bound to happen when users try to set up connections over a large space, and he is trying to extend the network to buildings within a four or five-acre radius. (Image: The Rusty Horseshoe Ranch). 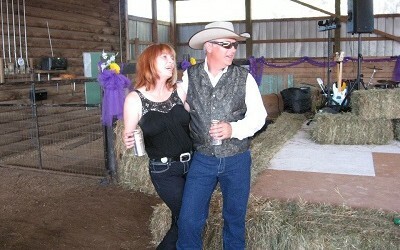 Ranch owners Keitrina and Chris Pettican. And as a business owner, he’d also like to be able to offer his customers a wireless connection while they’re indoors, giving them the chance to stream music or movies. The hope is to win the contest and to have the tools he needs to secure his ranch, Pettican says. Opening the ranch has been his wife’s lifelong dream, he adds, and he has the skills to configure his network. Putting them to use would give his customers peace of mind with their horses. With all three finalists now named in D-Link’s extreme networking makeover contest, contest entries are now closed. A winner will be announced on Dec. 19, so check back here to find out who’s taking home the $10,000 prize.